The pleasures of a picture book will soon open up to more children with disabilities who visit the Vigo County Public thanks to two Indiana State University education student organizations. About 20 members of the Bayh College of Education's Student Council for Exceptional Children and the student chapter of the National Student Speech Language and Hearing Association advised by instructor Lee Anne Luttrell teamed up Saturday to adapt the books that were purchased with a $2,250 Indiana Campus Compact grant awarded to Shawn Huisinga, assistant professor in the department of teaching and learning and faculty advisor for the Student Council for Exceptional Children. "It's important to make material accessible so every child will be able to enjoy picture books," said Huisinga, who proposed the project to the Student Council for Exceptional Children. "We stress to students in their classes that it is important to always adapt materials they use in their classrooms to meet the needs of all of their students." Approximately 230 preschool children in Vigo County have been initially identified as having a developmental delay or disability, according to data cited in the grant abstract. While adapted books could be a benefit to these students, such books cannot be purchased and were not available at the Vigo County Public Library. The grant helped purchase the picture books that students adapted with fluffers to make it easier to turn pages, added pictures to text and integrated sensory items. The books are expected to be delivered to the library next month. "It's vital for teachers to be able to meet the communication needs of all of their students, so it's important for me and other future educators to learn creative ideas to help reach them," said Brianna Schuster, a senior speech language pathology major from Terre Haute and vice president of Indiana State's National Student Speech Language Hearing Association. "If it helps a student to learn better by having printed out words on the page or having feathers on the page that they can feel, it will be my job as a future educator to meet that need." 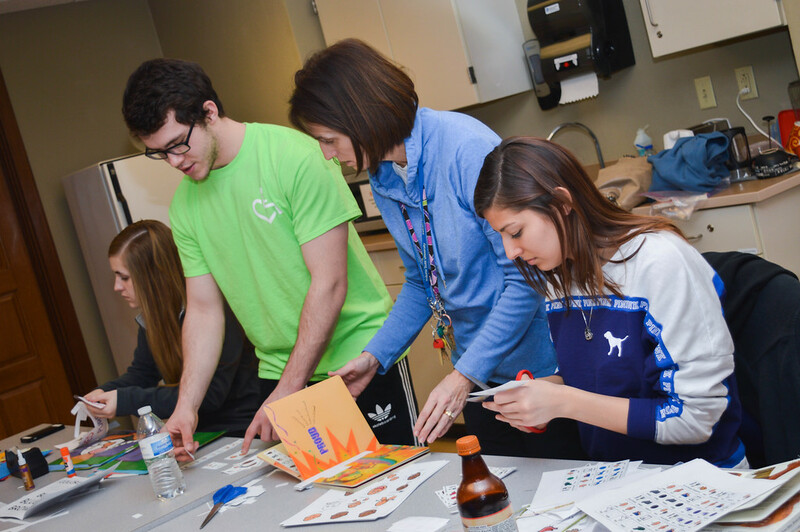 In April, Indiana State students will present the project at the International Convention for the Council for Exceptional Children in St. Louis. Contact: Shawn Huisinga, assistant professor, department of teaching and learning, Bayh College of Education, Indiana State University, shawn.huisinga@indstate.eduCouncil for Exceptional Children. "This project is a great way to learn about how I can meet the many different needs of the students who will be in my future classroom so that reading is an activity available to all of them." http://photos.indstate.edu/Events/Events-by-Year/2016/Building-Books-for-the/i-M6zNrdB/0/XL/February%2006%2C%202016-%20building%20books%20DSC_0554-XL.jpg - Shawn Huisinga, third from left, assistant professor in the department of teaching and learning and faculty advisor for the Student Council for Exceptional Children, assist education students as the adapt picture books that will be more user-friendly for children with disabilities. About 20 members of the Bayh College of Education's Student Council for Exceptional Children and the student chapter of the National Student Speech Language and Hearing Association advised by instructor Lee Anne Luttrell teamed up at University Hall on Feb. 6, 2016, to adapt the books that were purchased with a $2,250 Indiana Campus Compact grant that was awarded to Huisinga. http://photos.indstate.edu/Other/Media-Services/Submitted-Photos/Staff-Uploads/i-k86Tdrq/0/S/IMG_7812-S.jpg - About 20 members of the Bayh College of Education's Student Council for Exceptional Children and the student chapter of the National Student Speech Language and Hearing Association advised by instructor Lee Anne Luttrell teamed up at University Hall on Feb. 6, 2016, to adapt the books that were purchased with a $2,250 Indiana Campus Compact grant that was awarded to Shawn Huisinga, third from left, assistant professor in the department of teaching and learning and faculty advisor for the Student Council for Exceptional Children. 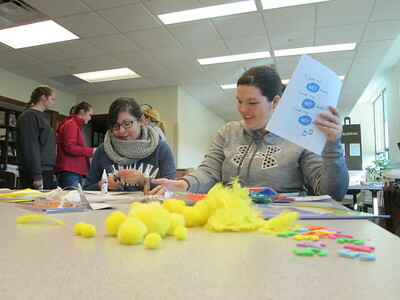 About 20 members from two education student groups adapted books for children with disabilities last Saturday. The books will be donated to the Vigo County Public Library.